Rabbi Glazerson is attacked by The International Congregation of Lord RayEL, Ra-el who believe that Raymond Elwood Howard Lear is the Returned Christ, Isa and Moshiach. But, what really do you expect from a bunch of pathetic morons? All images that are used in this blog are the intellectual property of I Love Jesus and have been downloaded from public Facebook Pages, namely, The International Congregation of Lord RayEL and Rabbi Glazerson’s You Tube Channel Page. This appalling behaviour follows Top Torah Code Researcher Matityahu Glazerson releasing exactly what the Congregation of Lord RayEL wanted, that their ‘Lord RayEL’ is in fact found in the Torah Codes. Rabbi Glazerson’s Code has yet again revealed that Raymond Elwood Howard Lear (Lord RayEl) is false. To be specific a liar and a cheat and is from the forces of Evil. 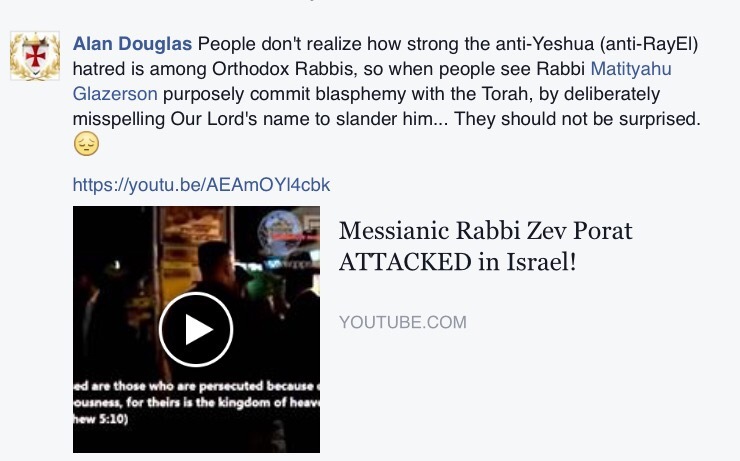 Refer back to our previous blog click Rabbi Glazerson Lord RayEl is Evil. This behaviour from the Ecumenical Order of Christ is hardly surprising, as the “top dogs” need to reclaim authority and control. The International Congregation of Lord RayEL claim that the incorrect spelling of RayEl was used in Rabbi Glazerson’s coding. 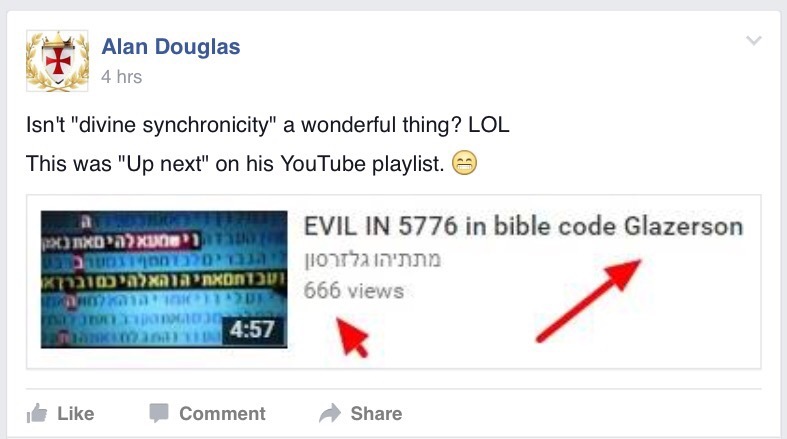 So now they are hell bent on slagging off this world renown Torah Code Researcher. Furthermore, The International Congregation of Lord RayEL also claim that Rabbi Glazerson has been stealing their Torah Codes. This is rather a big claim from a small man (even though he thinks he’s Moses) who has no authority whatsoever in the “Torah Code” community. 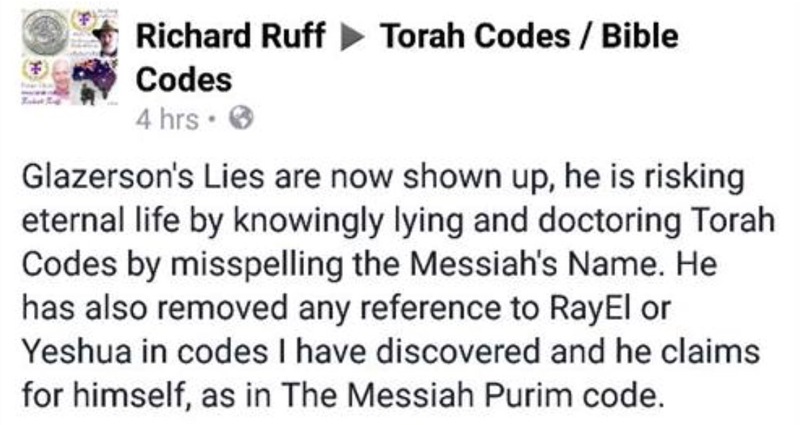 Richard Ruff then shamefully went onto create a table with the Good Rabbis name in calling him a “liar” and a “crybaby”. Sickening, then the other “clergy” applauded this outrageous behaviour. Even Clark Isaac cannot spell. Matityahu Glazerson posted his tables regarding RayEL on his public Facebook Page. 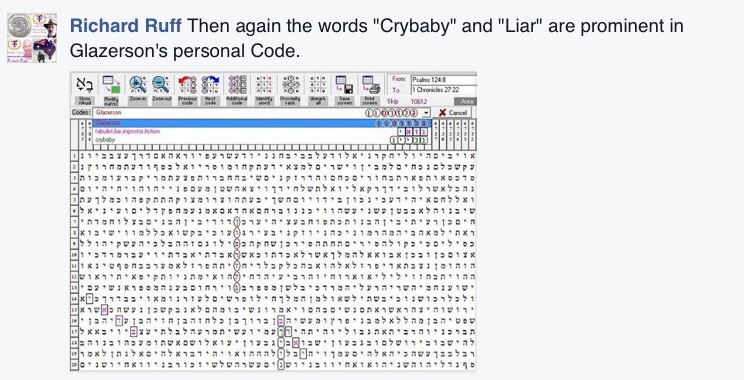 Not one member of the International Congregation of Lord RayEL disputed this code on Glazerson’s public Facebook page. Instead they posted on their “controlled” Facebook Groups where comments are deleted and only submissive fools can join. Suffice to say, if they did make these kind of comments on Rabbi Glazerson’s public Facebook page they would have been annihilated. Previous Previous post: Clark Isaac Is Lord RayEl in the YOU TUBE videos. Actually this is great. I’m also an expert in this topic therefore I can understand your hard work.